My daughter Anya is growing up fast. It seems like only yesterday I was carrying her in my arms and now she has already grown to half my height. Looks like she will cross my height very soon. 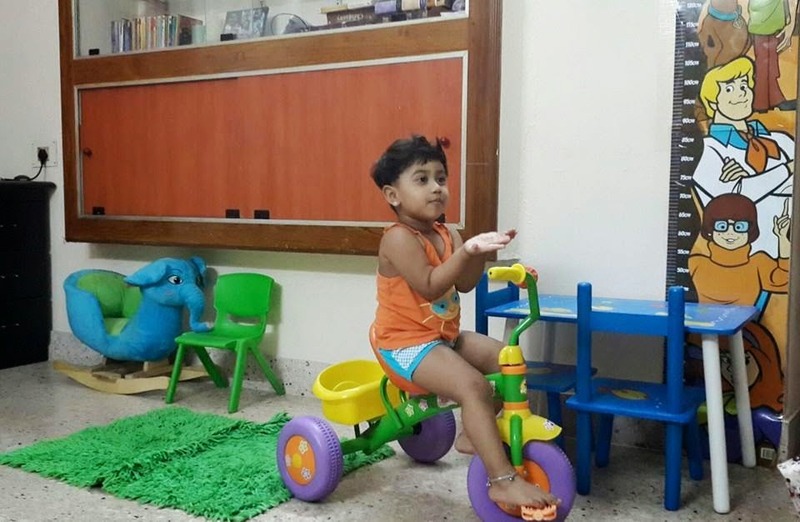 She is a rowdy in her play school. She beats up all the boys and she calls it as her choice. This picture shows her territory at our house. This is where she spends most of her time. She goes to her height measuring chart and says 85 cm. Though she has crossed 90 cms she still loves 85. There might be some reason. May be 85 is her favorite number. "Etti Py"- that is how she says that. The blue table is where she does her art work and the green mini carpet is where she plays with her toys. She also uses the table to climb up and reach inside the book shelf to flick my books. Only when I open some of my books, I would realise that she has left her mark in them. The crayon color work tells me that she had been there. In the above picture you can also spot an elephant. If only that elephant could speak, it would have cried out loud. She is supposed to sit on that elephant and rock to glory. But she pulls the elephant by its trunk and takes it to the garden. One day we found the elephant abandoned behind a flower pot. I can go on writing about my daughter. I will save it up for another post.